CAIRO • On her first day to school, 15-year-old Christian student Ferial Habib was stopped at the doorstep of her new high school with clear instructions: either put on a headscarf or no school this year. One day, Habib heard the school loudspeakers echoing her name and teachers with megaphones leading a number of students in chants of "We don't want Ferial here," the teenager told The Associated Press. Habib's was allowed last week to attend without the scarf, and civil rights advocates say her case is a rare one. But it stokes the fears of Egypt's significant Christian minority that they will become the victims as Islamists grow more assertive after the Feb. 11 toppling of President Hosni Mubarak. It also illustrates how amid the country's political turmoil, with little sense of who is in charge and government control weakened, Islamic conservatives in low-level posts can step in and try to unilaterally enforce their own decisions. Wagdi Halfa, one of Habib's lawyers, said the root problem is a lack of the rule of law. "We don't want more laws but we want to activate the laws already in place," he said. "We are in a dark tunnel in terms of sectarian tension. Even if you have the majority who are moderate Muslims, a minority of extremists can make big impact on them and poison their minds." The violence is particularly frustrating for Christians because soon after Mubarak's fall the new government promised to review and lift heavy Mubarak-era restrictions on building or renovating churches. The promise raised hopes among Christians that the government would establish a clear legal right to build, resolving an issue that in recent years has increasingly sparked riots. But the review never came, and Salafi clerics have increased their rhetoric against Christians, including accusing them of seeking to spread their faith with new churches. Habib's experience was startling because in general, Egypt's Christians, who make up at least 10 percent of the population of 80 million, have enjoyed relative freedom in terms of dress and worship. The vast majority of Muslim women in Egypt put on the headscarf, known as the higab, either for religious or social reasons, but there's little expectation that Christians wear it. "And if the father wants to move his daughter to another school, it is OK," he said. "All the girls, including the Christians, put on the head cover and they have no problem," he added. Habib's father Sorial complained to officials, demanding his daughter be allowed to attend without a scarf. "After the revolution, there are no administration and no officials to go to. The system is lax and there is no supervision from the ministry," he told AP. "If things were under control, extremists would not have a free hand to act as they wish." "I am happy I did what I want and that no one can force something on me. But I am afraid of the students and the teachers," she told AP. "The teachers are not normal with me and I am sure they will give me low grades at the end of the year." Hossam Bahgat, head of the Cairo-based Egyptian Initiative for Personal Rights, which tracks religious discrimination and other civil rights issues, said he had not seen a case like Habib's before. "We know that there is pressure on Muslim girls to put on the higab, especially in secondary school, not from the administration but from the girls." Recent attacks on churches in southern Egypt also illustrate the heat Christians are under. Under Mubarak-era rules, the building of a church or repairs for an existing one required permission from local authorities and the state security agency  a rule not applied to mosques. The rules sought to avoid outbursts of violence from Muslim hard-liners. Since permission was rarely given, Christians at times resorted to building churches in secret, often in parish guesthouses. Aswan's governor, Gen. Mustafa Kamel al-Sayyed, further hiked tensions by telling the media that the church was being built on the site of a guesthouse, suggesting it was illegal. In response, hundreds of Christians marched in front of the governor's office last week, demanding those behind the attack be prosecuted and families who lost homes be compensated. 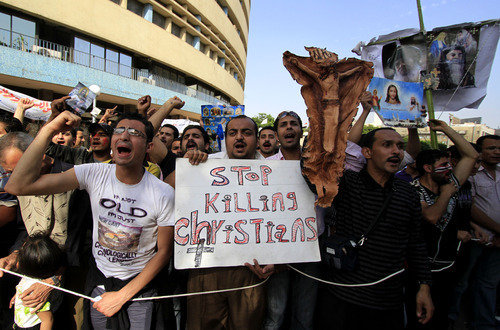 Christians also protested in Cairo, cutting off a main avenue in the heart of the capital, demanding the governor's ouster, until soldiers dispersed them by force. Days after the Aswan attack, Muslim villagers in the southern province of Sohag tried to storm Saint Girgis church, shouting "No to church construction," as Christians on rooftops rained stones down on them. The assault was prompted by construction of a church in a guesthouse.